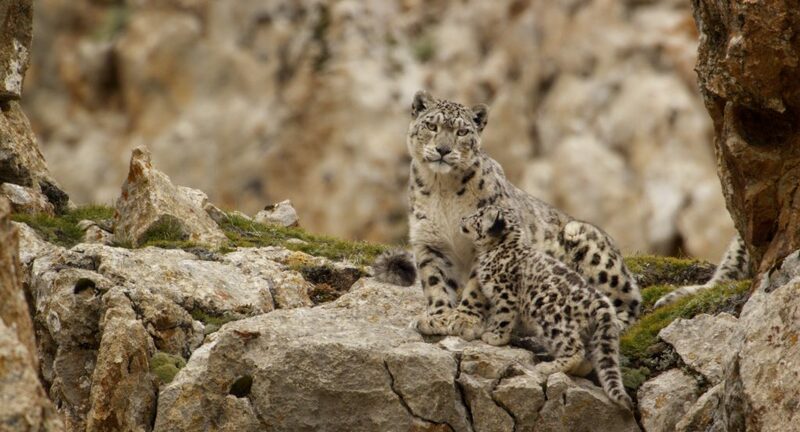 Snow leopards steal the movie in Born in China. Disneynature’s seventh feature, Born in China, doesn’t stray from the formula (anthropomorphizing, cuteness galore), but next to previous entries, it inches closer to the darkness of the animal kingdom. Narrated competently by John Krasinski (he is no Samuel L. Jackson, but who is it? ), Born in China has plenty of leads: A family of snow leopards; an overprotective mama panda and her free-spirited cub; a golden snub-nosed monkey with abandonment issues; and a number of personality-free cranes and antelopes. The heart of the movie lies with the snow leopards, a female and her two cubs. Through the course of the film, the felines go from ruling the mountain to fighting to survive. Historically, Disneynature has avoided showing animal violence. This particular storyline is not the exception, but certain information voids in the narrative are somehow more unsettling. The cinematography is extraordinary even for Disneynature’s high standards. The snow leopard hunting sequences (involving sharp cliffs and pugnacious would-be pray) are spectacular. The making-of snippets during the credits are particularly enlightening this time around. While I understand the series targets younger audiences, the narrative arcs are feeling repetitive (this series appeals more to family than The Fast and the Furious) and the editing stitches are showing. It’s undoubtedly a pickle moving forward, but it’s an interesting one. 3/5 planets. Born in China opens tomorrow Friday, April 21st, everywhere.